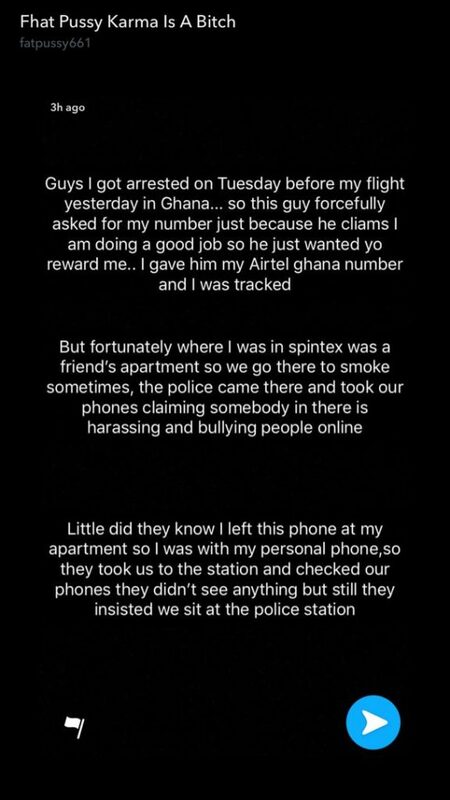 At long last, the wishes of most Ghanaian celebrities captured in the alleged secrets from the snapchat blogger, ‘fatpu$$y’ has been granted has the person behind the said account has been arrested. The ‘invisible’ person behind the account confirmed the arrest via his snapchat handle and added that he is has since been granted bail. The person stated that the arrest took place at a friend’s house, and also revealed that, former AMG Business boss, Showboy helped in securing the bail.